Disney’s latest film may be there best yet. And it’s a musical. As a girl, princess Anna gets hurt due to the ice powers of her sister Elza. Saved by magic from the Troll King, Anna forgets everything meaning that her sister must stay away from her for the rest of her life. Years later at Elza’s coronation, Anna falls in love and Elza forbids the engagement before accidentally using magic. Fearing for her safety, Elza inadvertently traps the Kingdom of Arendelle in ice then runs away. With the help of Kristoff and his reindeer Sven, Anna embarks on a quest to save Elza, the kingdom, and to mend her relationship with her sister. This musical, fantasy comedy is one of Disney’s greatest films for a reason. Having made over $1billion worldwide, Frozen also picked up two Academy Awards for Best Animated Feature and Best Original Song (Let It Go). The film’s themes of love and sacrifice ring true and get stronger as the characters develop throughout the story. What drives most people to love the movie is that this is Disney’s first movie where the first guy isn’t the perfect match for the girl. The film has a killer soundtrack and the songs are all light-hearted and funny. The comedic edge of the film is what makes it sound out, whether it’s Olaf the snowman’s constant wish for summer, or the bromance between Kristoff and Sven, Frozen is a joy from the start. 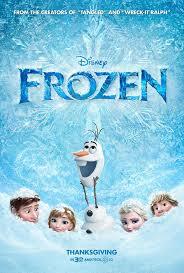 Frozen is a light-hearted family musical that hits all the right notes. From its amazing cast, to its great soundtrack, to the feel-good feeling of the movie, Frozen has quickly become viewed as one of the greatest movies ever made by Disney. Tagged 5/5, Animated, Comedy, Film, Musical, Review, Reviews. Bookmark the permalink.